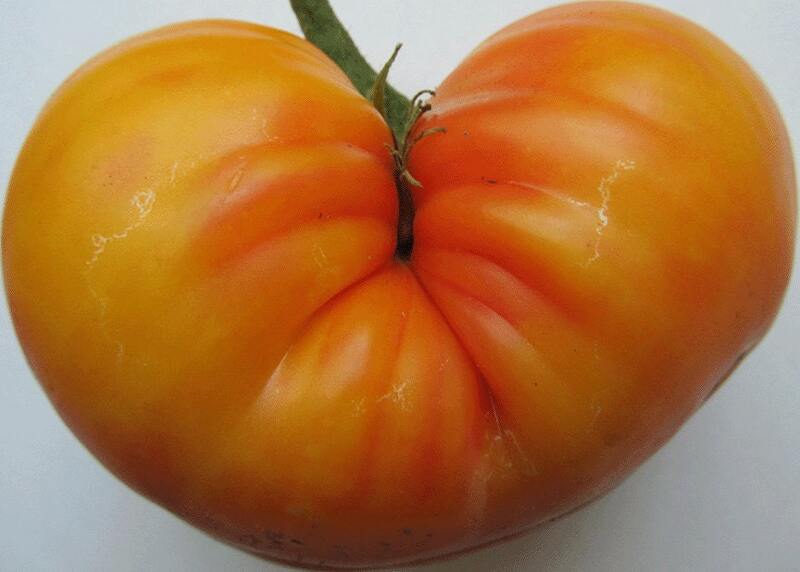 The quintessential heirloom tomato: squat and often wonky in shape, not your regular red, and uncommonly delicious. The yellow to rose striping goes all the way through, often making dazzling sunburst patterns. Flesh is solid and meaty with small seed cavities, making it an ideal slicer. We noticed a lot of variation in the Big Rainbows we’d grown from different seed sources, so in 2012 we tried seed from five sources (E & R, Baker Creek, Cook’s Garden, Victory, and Laytonville gardener Jane Evans). We eliminated the off-types early (and there were some puny ones unworthy of the name Big Rainbow) and saved the fabulous, the best being Jane Evans’. Culture: Start seeds indoors six weeks before last frost. Though originally a Southern variety used to 24/7 warmth and high humidity, these seeds are from plants that performed pretty darn well with our 45-degree summer nights.